When the Singularity arrives and computers possess superhuman intelligence, will there be an ecstatic merging of machine and mind--or an instantaneous techno-apocalypse? Will there be the enslavement of humanity or "the Rapture of the Nerds"? The post-human future is here in its wildest science-fictional imaginings and intriguing scientific speculations. 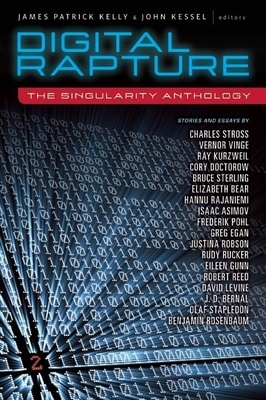 This far-reaching anthology traces the path of the Singularity, an era when advances in technology will totally transform human reality. It travels to the alien far-future of H. G. Wells (Mind at the End of Its Tether), to the almost human near-future of Ray Kurzweil (The Singularity Is Near), from Elizabeth Bear's fusion of woman, machine, God, and shark ("The Inevitable Heat Death of the Universe"), to Isaac Asimov's evolution of ineffable logic ("The Last Question"). As intelligence both figuratively (and possibly literally) explodes, science-fiction authors and futurists have dared to peek over the edge of the event horizon. Join them there. James Patrick Kelly is the Hugo, Nebula, and Italia award-winning author of Burn, Think Like a Dinosaur, and Wildlife. He is a member of the faculty of the Stonecoast Creative Writing MFA Program at the University of Southern Maine. He has co-edited a series of anthologies with John Kessel, described by the Encyclopedia of Science Fiction as "each surveying with balance and care a potentially disputed territory within the field." Kelly is the technology columnist for Asimov's Science Fiction magazine and the publisher of the e-book 'zine Strangeways. John Kessel is a Nebula, Sturgeon, and Locus award winner and the author of Corrupting Dr. Nice, Good News From Outer Space, and The Pure Product. He teaches courses in science-fiction, fantasy, and fiction writing at North Carolina State University. His criticism has appeared in Foundation, the Los Angeles Times Book Review, the New York Review of Science Fiction, and Science Fiction Age.